Few images conjure up such peace, relaxation, beauty or just plain fun as the sight of a beautiful sunset sparkling in the reflection of clear blue water with a sailboat skimming over the horizon. The Lake Bluff Yacht Club takes advantage of our proximity to Lake Michigan by indulging our recreational fancies. Membership in the LBYC consists of more than 120 families from Lake Bluff and surrounding communities. The majority of our members are boat owners and store their Sunfish in our storage compound on the Lake Bluff South Beach. If you don't own a boat, no problem, the LBYC has several Sunfish available for use by social members on weekends for free. The club is also accomodating an increasing number of kayakers who also store their boats at the beach. Sailors and non-sailors alike come together in companionship as the Club hosts many social events such as "Brunch on the Bluff", a wonderful way to enjoy a meal while overlooking Lake Michigan, Lobster Boil on the Beach, spring and fall cocktail parties and brat roasts. After reviewing the ranks of our social members we discovered that many of the social members are also sailors. They sail a wide variety of boats at other clubs from Chicago to Waukegan. One of these members won his sailboat class in the Mackinac race last summer. In conjunction with the Lake Bluff Park District, the LBYC helps support the Junior Sailing Program which enables young people to become involved in an activity they can enjoy their entire life. Contact the Lake Bluff Park District for details. In recent years, the LBYC racing fleet has become the most active in the Chicago area. So if you are an active racing sailor or have an interest in learning to sail or are just looking for a great social club, the Lake Bluff Yacht Club is the Club for you. The Lake Bluff Yacht Club, originally known as the The Lake Bluff Sailing Association, was founded in 1961 by Ed Freeman, Bill Gorman and Bill Hensley. At that time there was no boat storage or committee boat so they used the concrete pier on the beach at that time to form a starting line for racing. The first Midwest Sunfish/Sailfish Regatta was sponsored by the Lake Bluff group and held at Illinois Beach in 1962. In April of 1963 the group initiated construction of needed boat storage on our beach. They secured permission from the North Shore Sanitary District to build a storage facility. Each member contributed $50 and pitched in to help build the north compound, which was finished in May. The south compound was erected in 1965 and remains in use today. The north compound was destroyed by high water several years ago and was rebuilt by the club. The following quote is our mission statement as developed by our long-term planning committee: "The Lake Bluff Yacht Club will be a world class Sunfish sailing club providing the highest quality sailing programs, including racing instruction, family participation, social activities, and community involvement." In the past couple of years we have come to realize that our Sunfish racing fleet is the most active in the Chicago area. Area Sunfish sailors have been looking to us for a leadership role in promoting Sunfish sailing. Many of the top Sunfish sailors who frequent the national and international Sunfish racing events are from the Chicago area, and have raced with us. They talk about how active our fleet is at these events, and they are impressed by the competition they encounter when they sail here. We want to continue to improve our Sunfish racing program, and increase participation at all levels of sailing, from beginners to active racers. 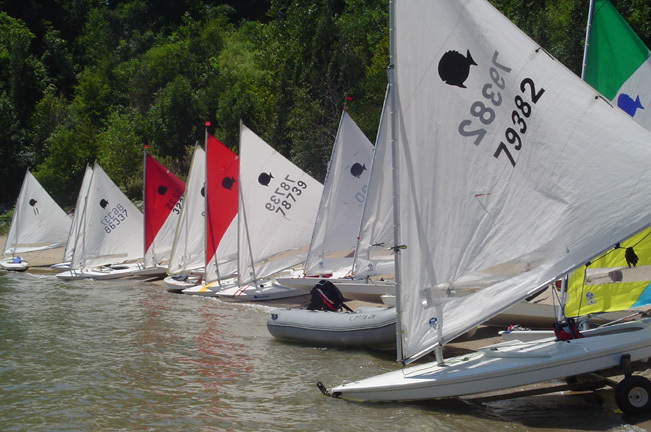 Lake Bluf Yacht hosts an annual Sunfish regatta every August, and has hosted other official Sunfish Class events such as the Sunfish North American Women's Championship, Sunfish North American Championship, Regional Regatta's, and is planning to soon host the Sunfish Master's Regatta. enable the Yacht Club's sailing program to become more of a family activity by involving our kids.